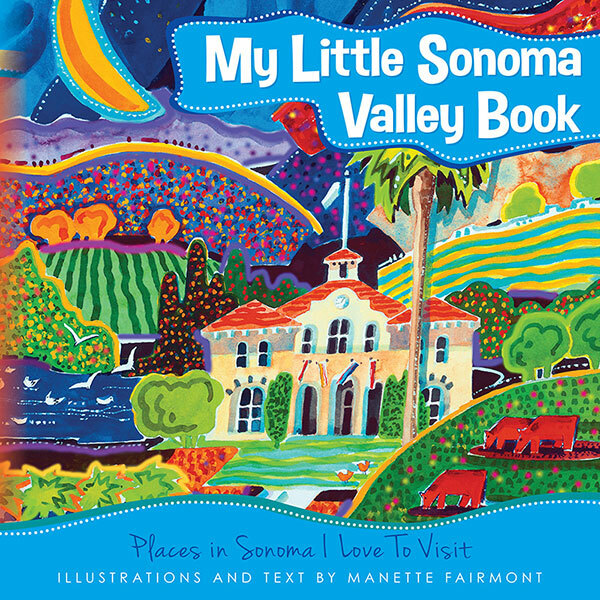 Manette Fairmont, award winning artist and owner of the Fairmont Gallery, gathered her unique colorful Folk Art watercolors into a charming book, depicting cherished historic buildings and locations of Sonoma Valley, California Wine Country. An interactive book that gives the reader a fun glimpse into the historic town of Sonoma where the California Bear Flag was originally raised. This delightful book was created to bring a smile to the young and young at heart! Adults are invited to enjoy this book for the fun and colorful illustrations, but it is also written with children pre-school to 8 years of age in mind. International Artist Magazine International Showcase of Prizewinners April/May, 2001 Issue. Watercolor West National Exhibition XLIV 2012, watercolor painting by Manette Fairmont titled "Above The Firmament" to be on exhibition at the City of Brea Gallery. Opening reception Saturday, October 13, 2012 5:00 - 7:00. Exhibition will be on display until November. Watercolor West National Exhibit XLIII 2011, watercolor painting by Manette Fairmont Titled "Hilltop View" to be exhibited at the City of Brea Gallery. Opening reception Saturday October 12th 2011 5:00 - 7:00. California Watercolor Association National Exhibition 2011, watercolor painting by Manette Fairmont Titled: "Above the Road" to be exhibited at the Garen Art Center in Marin August 20th 2011. Manette's painting titled: "Russian River II" is being featured in this national exhibition of watercolor in San Francisco at the Presidio Officers Club Museum. March 18 - May 24, 2009. 50 Moraga Avenue. Many of the top watercolor painters in the U.S. will be among those on exhibition. Manette's painting titled: "After The Storm" has just received the highest honor, First Place, Gold Metal Award for this years exhibition. 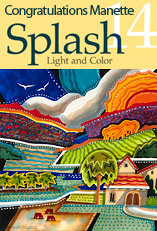 The top watercolor painters in the U.S.. will be among those featured at this special show. The show will be held October 3rd to December 6th, 2007 at The Presidio Officers' Club in San Francisco. Manette Fairmont's painting, titled "Rain Storm," was recently accepted into this prestigious National watercolor Exhibition. The Juror was, Daniel Piersol, Deputy Director for Programs, Mississippi Museum of Art. The National Museum Exhibit at the Springfield Art Museum in Springfield Missouri. June 10 - August 6, 2006. Manette's painting, titled "If Only She Knew" was recently accepted into this national watercolor exhibition in San Francisco. The Juror Of Selection was Mel Stabin, AWS, NWS, nationally renowned watercolor painter. The exhibit will be hosted at the Academy of Art University Gallery at 79 Montgomery Street, San Francisco, California. October 2- 27, 2006. Manette's painting titled "Russian River" was recently accepted into this national watercolor exhibit and received the prestigious "Janice Oprium" award, 6th place. The Juror for this years exhibition was, Barbara Nechis, NWS, AWS, a nationally renowned watercolor painter. The exhibit will be featured at the Brea Civic and Cultural Center Gallery in Brea, California. October 1 - December 10, 2006. Manette's painting "Morning Fog" was just accepted into the Springfield Art Museum in Springfield, Missouri. The juror is Joseph Jacobs, an independent curator, critic and writer in New York City. Curator of the Newark Museum. The Exhibit opens June 12th - August 8th 2004.
awarded 3rd Place by Juror, Stephen Quiller . The exhibit will be presented at the Riverside Art Museum in Riverside, California, September 6th through October 25th 2003. Manette will also receive her election to Signature Membership Status, WW, to the Watercolor West Society at the Award ceremony. accepted to the at the Springfield Art Museum, June 3rd through August 18th 2003. April 25 - June 1. 2003. Manette Fairmont Painting, "Three Corners" will be on exhibition. A prestigious National watercolor exhibition of the Watercolor U.S.A Honor Society, an invitational exhibition only. Springfield Art Museum, 1111 East Brookside Drive, Springfield, Missouri. Please call (417) 837-5700. 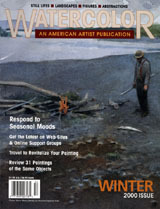 Check out Manette Fairmont's recent documented interview about her art career, by the sponsors of Biblewise.com,Teen Time, last January and February 2004. Click on the following links for parts I and II.